Aspartate dehydrogenase is a new enzyme discovered by Northeast Structural Genomics Consortium. The path to discovery began with the genome of the bacterium Thermotoga maritima, a bacterium found in geothermally-heated sediments in the ocean. The gene for this protein was interesting for several reasons. First, similar proteins are found in many other organisms, and thus the protein may play an important role in cellular function. Also, the gene was found as part of a larger operon that includes two enzymes that are involved in the synthesis of nicotinamide rings. Many other bacteria have a similar operon, but it usually includes a gene that encodes aspartate oxidase instead of this new protein. Based on this information, the protein was synthesized and crystallized, and the structure solved by x-ray crystallography. 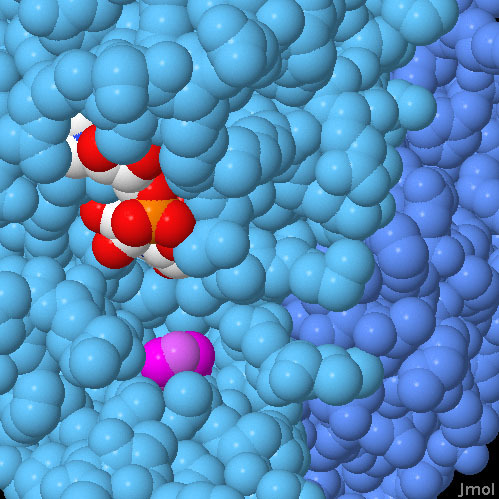 The structure of this protein revealed a small protein with NAD bound in a deep pocket. The fold of the protein is a familiar Rossmann fold, which is common in enzymes that use NAD in their reactions, suggesting that the protein may be a dehydrogenase. Based on these observations, the enzyme was tested for function with a variety of substrates and cofactors, and it was found to be a dehydrogenase that uses NAD to oxidize aspartate. Further testing showed that it is highly specific for aspartate and doesn't oxidize the similar amino acids glutamate and asparagine. Based on these results, the new enzyme was named "asparate dehydrogenase." Our own cells are not able to build the nicotinamide ring in NAD, so we have to obtain this essential molecule in our diet as a vitamin. Most bacteria, however, are able to build it from scratch. The first step in this process is the oxidation of aspartate to iminoaspartate, which will ultimately form half of the nicotinamide ring. We now know that bacteria can use (at least) two ways to perform this reaction. Some bacteria use the enzyme aspartate oxidase, which uses an FAD cofactor and oxygen or fumarate. This new structure revealed that other bacteria, such as Thermotoga maritima, use a different route, using NAD as a cofactor in the first step towards creation of more NAD. You can take a closer look at this enzyme in PDB entry 1j5p. The enzyme is a symmetrical complex of two subunits, with two identical active sites on opposite sides of the dimer. 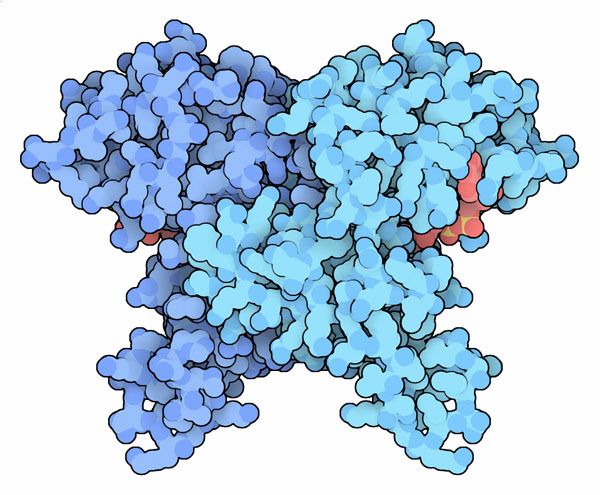 The active site of aspartate dehydrogenase is found in a deep pocket that holds the NAD cofactor and the substrate. A nearby histidine amino acid (shown in magenta in the Jmol image below) is proposed to be an important catalytic residue. The presumed active site of aspartate dehydrogenase is found in a deep pocket which holds the substrate aspartate and the cofactor NAD. This structure includes NAD bound in the active site (colored with atomic colors), but it doesn't include the substrate. A nearby histidine (colored magenta) is thought to be an important for catalyzing the reaction. Z. Yang, A. Savchenko, A. Yakunin, R. Zhang, A. Edwards, C. Arrowsmith and L. Tong (2003) Aspartate dehydrogenase, a novel enzyme identified from structural and functional studies of TM1643. Journal of Biological Chemistry 278, 8804-8808.